Woohoo more wedding crafts! Aaron is a fashionable dude and for the wedding, he's forcing his buddies to be fashionable as well. He picked out a super cool suit for him and the guys, and we found some great olive green ties that matched our vision for the color scheme. We thought it would be fun to find unique pocket squares for each of the guys so that they wouldn't match exactly. 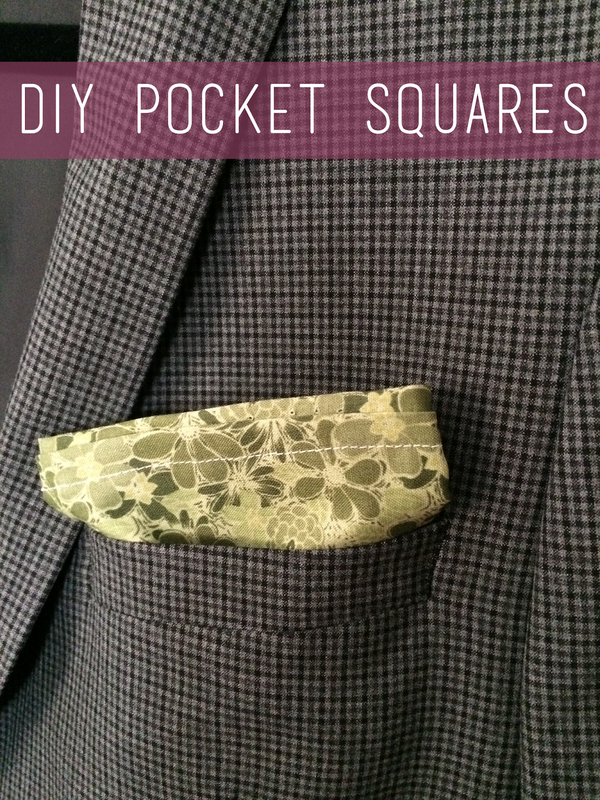 We were disappointed to discover that olive green is not a popular color for pocket squares, especially in the middle of April. We didn't want to wait until the fall to find them because that would be cutting it a little close to the wedding, so off we went to find fabric to make them. I basically followed SewTacey's tutorial exactly and it was very easy to follow! The only thing I did differently was use a mini hair straightener to press the edges. I love using my mini straightener for things like hems and edges because I don't have to drag out my bulky ironing board. I usually keep it next to my machines on my desk, so I don't even have to move really! Unfortunately, we were only able to find 2 fabrics we liked, so we'll have to keep searching for 2 more.